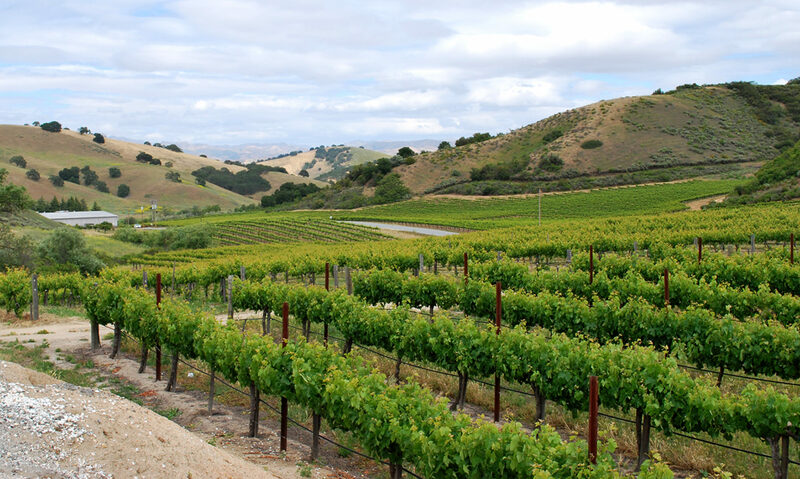 Sheila at Orfila recommended two other wineries to us, one of which was Cordiano. “Make sure to get the pizza!” she said. On paper, Cordiano didn’t look that far away, but it couldn’t have felt more distant. We drove down a narrow, twisty road, past palm tree farms and along the edge of steep drops, with the kind of vistas you only get in the hills of Southern California. 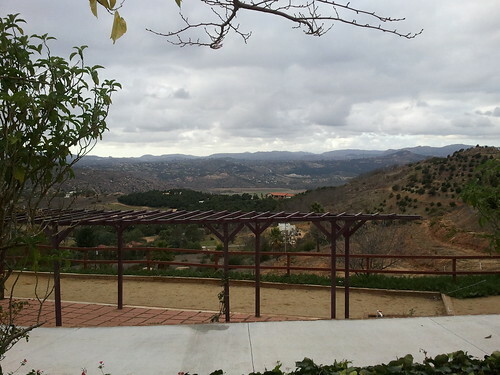 The place that had the best views, however, was the back porch of Cordiano Winery. On a clear day you can see forever - and on a cloudy day, you can still see into the next county. The weather had taken a turn for the cold and windy as we drove up to Cordiano, and ominous rain clouds threatened. The throngs of visitors drinking wine on the expansive back patio of Cordiano didn’t seem to notice. We’d arrived in the middle of an intersection between a party bus and a wedding reception, and the crowd was in a festive mood. The vibe reminded us strongly of Malibu Wines in LA. Cordiano’s outdoor pizza oven, located next to the tasting counter, was going like gangbusters. Every visitor was digging in. The smell of the pizza was deliciously overwhelming on the back patio. Unfortunately, the smell was so overwhelming that we couldn’t smell the wine. As we tasted, our palates imparted the pizza flavors we were smelling to the wine. Anxious to get a better assessment of the wines – and get warm, since neither of us had dressed for the sudden chill – we moved into the lovely indoor tasting space. We couldn’t smell the pizza oven inside, but that was because the fragrances from the large scented candles placed on the tasting bar overwhelmed any lingering aromas from outside. Again, the scent overrode our palates, lending every wine we tasted a strange apple-Jolly Rancher taste, not what I’d expect from a cabernet sauvignon. I had always heard how important scent was to the wine tasting experience. Friends who are serious wine snobs have told me that if I wear perfume while tasting, it will affect the flavor of the wine. I had shrugged this off, but my experience at Cordiano really brought this home. I don’t feel I can give a real assessment of their wines because my taste buds were so strongly affected by the non-wine smells I experienced. Cordiano’s ambiance is great, and they throw one heck of a party. I’d like to go back there sometime on a warm, sunny day, kick back on their patio, and see if I can get a better assessment of their wines.